A free ebook provided by the Library of Congress containing background information and primary sources. This is a reference book that is part of the database collection. You will need to log in to use this resource. We also have this in print on the cart with the other books. 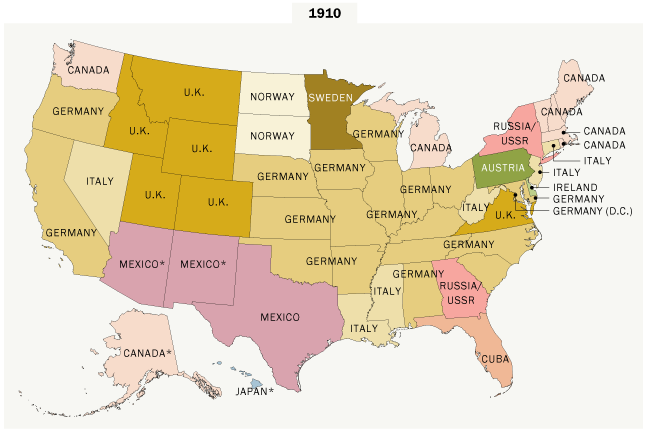 Overview article describing America's various waves of immigration. A dense site from Harvard University, with background information and primary sources (letters and memoirs). Data and analysis of the movement of people around the world. Oral histories from the program that brought Mexican agricultural workers to the United States from1942 to1964. Memoirs of 13 Mexican migrants. Written in Spanish and English. Historical immigration statistics from the US Census Bureau. A collection of letters from the mid-1800's, sent by Irish immigrants to Pennsylvania. Audio interviews with 150 people who immigrated to Michigan from Italy in the 1900s. Memoirs of Mexican migrants. This book is written in Spanish. Detailed immigration information for the years 1996 - 2015 from the Department of Homeland Security. Books: A number of books are on a cart in the library including Historical Statistics of the United States which has historical immigration data. Newspaper databases: Read about the immigrant experience and the reaction to immigrants in newspapers from your time period. Access archived copies of the New York Times, Wall Street Journal, Christian Science Monitor, Washington Post and Los Angeles Times.